JAMSHEDPUR: Skipper Philip Adjah Tetteh’s hat-trick went in vain as Mohammedan Sporting Club failed to qualify for the Final Round of 2018/19 Hero 2nd Division League despite winning their last Preliminary Round match 4-2 against Jamshedpur FC Reserves on Friday at the JRD Tata Sports Complex in Jamshedpur. Going into the match, Mohammedan SC knew they had to win at any cost while at the same time hoping that TRAU FC and Rainbow AC drop points. Though ATK Reserves did them a favour by beating Rainbow AC 2-1, but Princewill Emeka’s late goal shattered Mohammedan SC’s dreams as TRAU edged past Chhinga Veng FC 3-2 to take the second spot in Group C.
Desmos Arthur Kouassi (13′) opened the scoring for Mohammedan SC before Adjah (17′, 28′ & 52′) single-handedly dismantled Jamshedpur. Nonetheless, the hosts did not go down without a fight as they pulled a couple of goals back though Sohrab Akhtar (15′) and Subhankar Sana (58′). 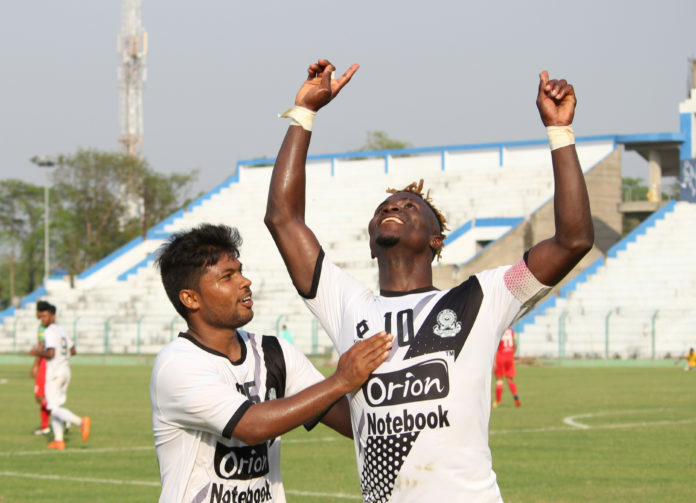 Mohammedan SC were expecting a tough encounter when they hosted Jamshedpur in Kalyani last month and that’s precisely what they got in a high-scoring affair. Kouassi started it all with a good finish after 13 minutes, Jamshedpur keeper Amrit Gope trying but unable to keep the Ivorian’s strike out. That lead lasted just eight minutes though as Sohrab launched a thunderous long-range shot that had the beating of Mohammedan SC goalkeeper Priyant Singh. It was 3-1 in the 28th minute when Kouassi was hauled down in the box and Adjah converted the penalty to start a period in which Mohammedan SC had Jamshedpur under severe pressure, however, poor decision-making let them down in the final third which saw Raghu Nandy’s charges went into the breather leading 3-1.